Yes, Peggy, rumor has it that Founding Father Alexander Hamilton was a bit of a dog when it came to the ladies. Actually, you could say he was more of a tomcat; and George Washington’s wife, Martha, seemed to agree. That’s apparently why Martha Washington named their feral tomcat “Hamilton,” after Alexander due to his reputation as a scoundrel and womanizer. @drewsclues825 Martha Washington once named a feral tomcat after him, because both he n the cat went prowling for ladies on the reg. (Ummm… double entendre?) Anyway, it was apparently Hamilton’s curiosity with the ladies (and not observing the “bounds of moderation”) that killed his political career, specifically when he admitted to a lengthy affair with a married woman in the 95-page “Reynold’s Pamphlet“ of 1797. Hmmm… Sounds like Hamilton’s reputation of being a tomcat is well-deserved. Although Hamilton did seem to always land on his feet, the last of his nine lives ended in 1804 when he was mortally wounded in a famous duel with Aaron Burr. Because there is no written records about the Washington’s cats, it would be hard to prove the rumor definitively either way. However, the story seems to have credibility, and bones found around Mt. Vernon confirm that feral cats were present while the Washington’s lived there. So, Peggy, the rumor that Martha Washington named her cat after Alexander Hamilton is probably true. 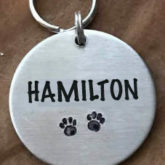 As you can imagine, having a cat named after you is the highest of honors for any human, so Hamilton’s eponymous kitty at Mt. Vernon is surely his most significant legacy. 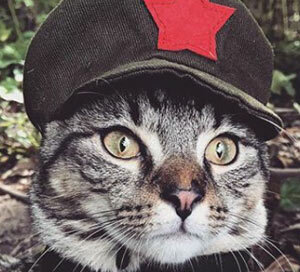 So, What is a “feral tomcat” anyway? 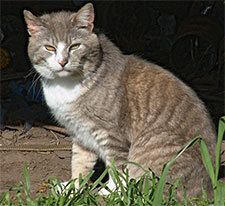 A “feral” cat is a free-roaming feline that lives in the wild and is untamed. A feral cat uses its hunting skills and wild ways to survive. This entry was posted in ask chairman meow, popular and tagged alexander hamilton, george washington, hamilton, Lin Manuel Miranda, martha washington, pop culture on June 14, 2017 by admin. Why would one name a feral cat anyway? ha ha. I guess Martha was just trying to prove a point. 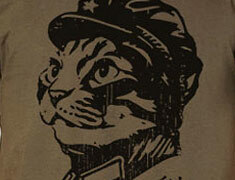 Although, wasn’t George Washington a bit of a Tomcat too?